Oops! While translating the subtitles of the penultimate scene of Chitrangada last night, I missed my turn to give you an update on our daily progress. So here it is – better late than never. I realise that my introduction to Sayan Bandyopadhyay in my post about gathering the team for The Story of Gitanjali was quite brief. Now I have the opportunity to provide more detail. Kaberi and I began yesterday by exploring Sayan’s page on ReverbNation. We ended up listening to all 12 of his songs published there, which included 8 from his solo performance at the Rabindra-Okakura Bhavan in Kolkata on 10 September 2011. If you are one of the many millions of fans of Rabindrasangeet (Tagore songs) around the world, you will be impressed. We are very pleased and honoured that Sayan has agreed to join us in Brussels for The Story of Gitanjali on 23 September. Later in the day, I spoke to flamenco teacher and dancer Luisa Castellanos about reciting one of the Gitanjali poems in Spanish for The Story of Gitanjali. Meanwhile, Kaberi continued to explore online ticketing options. I also started to prepare the sequence which will be projected above the performers during The Story of Gitanjali. It’s quite a challenge to include live subtitling but I now know how we’ll be doing it. I also realised that the Wikipedia article on the Gitanjali hardly did justice to its subject. At least I think I’ve managed to resolve the long-running conflict between authors disputing how to reflect the distinction between the Bengali Gitanjali and the English Gitanjali. It still needs further fixing – perhaps someone else would like to do so? A friend mentioned that Pankaj Mishra refers to Tagore in his new book, From the ruins of empire. This article about A Poet Unwelcome is an adapted extract from the book about Tagore’s ‘unkind reception in China’ in 1924. This reminded me to see if we could make contact with the team which has been translating Tagore’s works into Chinese. In doing so, I noticed that the first Chinese collection of Tagore’s songs was released recently and that Chitrangada was staged at the Lanzhou University. The day ended with going back to translating Chitrangada … and my missing my blogging cue! Finally, as today is the 65th anniversary of Indian independence, a ‘happy birthday’ to Indians around the world. A reminder of my blog post exactly a year ago about Tagore and the Indian national anthem. The Story of Gitanjali may not be as elaborate as the opening ceremony of the Olympics. However, it does need careful preparation and planning. Apart from the audience in the Gold Hall of the Square Brussels, where we will be on stage, we also need to keep in mind those who will be watching it on screens elsewhere. On Thursday, I visited the Gold Hall with the team which will be filming the show. It’s quite a large auditorium which is part of a complex which was built in 1957, at the same time as the iconic Brussels Atomium. The complex used to be known as the Palais des Congrés but was extensively renovated a few years ago. It reopened in 2009, since when it has been called the Square Brussels. The annual Magritte Awards ceremony (the Belgian equivalent of the French César Awards and the American Academy Awards) is held in the same hall. The foyers we will be using for the charity gala premiere have original murals by the Belgian surrealist painters Paul Delvaux and René Magritte. Courtesy of the Indian Embassy in Brussels, we should have two exhibitions in the foyers, one on Tagore and the Romance of Travel and the other of digital prints of some of Tagore’s paintings. The Story of Gitanjali begins with the above poem. I haven’t yet decided which language it will be recited in – that will depend on the actors. As I mentioned in my previous post, I’ve been looking for actors in Brussels who could each recite one of the 13 poems in a different European language. Several actors have come forward, particularly thanks to our friend Lilian Eilers and the English language theatre groups in Brussels, as well as my colleagues Béla Dajka and Stephanie Mitchell. The languages and actors confirmed so far are French (Arlette Schreiber, a leading actress with the Belgian National Theatre for many years) and English (Prajna Paramita, who recently performed as Cleopatra in a production of Anthony & Cleopatra). Both already knew Tagore’s poems. I’ve also heard from/about Czech, Danish, Dutch, Hungarian, Italian, Romanian, Serbian, Slovak and Spanish actors. The 11 songs in The Story of Gitanjali will be performed by a small team of singers and musicians. The singers will be Manini Mukhopadhyay, Sayan Bandopadhyay and Kaberi. Manini is one of the top Bengali female vocalists in this style (known as Rabindrasangeet). She sang the title roles in all three of our film versions of Tagore’s dance-dramas, including Chitrangada. You can hear her singing in the clip from Shyama on the right of this page. Sayan is a rising male vocalist in this style. Has will be singing at a concert on 22 August at the 1,100-seat Rabindra Sadan hall in Kolkata. He is also the grandson of Professor Somendranath Bandopadhyay, the internationally recognised authority on Tagore who has been our mentor throughout the Tagore dance film trilogy project. In parallel with this, I will need to prepare what will be projected on the screen above the singers and musicians, including the English and French subtitles of whatever is happening on stage. This draws on our experience of using a screen to provide a virtual set at London’s Purcell Room when Kaberi was giving a solo Manipuri performance there, as well as the technique we used to project English and Arabic subtitles for the tour of Shyama in Egypt with Kaberi and her team. In Part 1, I explained the background to the tour and in part 2, I described the reaction to Shyama in Egypt. The performances of Shyama in Egypt took place the week before the first anniversary of the popular revolution which made Tahrir Square the focus of international attention, deposed President Hosni Mubarak and launched the “Arab Spring” last year. It was an exciting time to be there. The story of Shyama, which is based on a Buddhist legend, is primarily one of love and sacrifice. It is as much of a romantic tragedy as Shakespeare’s Romeo & Juliet. The cause of the tragedy in Shyama is set out in its seemingly innocuous opening scene. Bojroshen, a foreign merchant, is examining his acquisitions when a Friend approaches. The Friend warns him that the Queen has heard of the emerald necklace he is carrying and has sent guards to look for him. Soon after the Friend urges Bojroshen to leave, an agent of the King’s Guard duly arrives. As we heard while we were in Egypt, this idea of a “Queen” wanting a necklace may have reminded people watching Shyama there of another necklace which was the focus of news attention there last year. Allegedly, Suzane Mubarak, wife of former President Mubarak, had visited the jewellery museum in Alexandria and noticed that a gold necklace which had belonged to Princess Samiha Mohamed Ali had the initials ‘S M’ engraved on it and had asked whether the initials could stand for Suzane Mubarak. Allegedly, the following morning, the necklace was delivered to her. The Supreme Public Funds Prosecutor looked into the allegations but decided to hold back investigations after finding the necklace in its original display in the museum and asserted that the allegations were unfounded. An official apology was submitted to the prosecutor by the person making the allegations and the insult or libel lawsuits filed against him were dropped. Returning to Shyama, we are next introduced to Uttiyo, who meets Shyama’s companions in her audience chamber at the palace. He is a regular visitor and has admired Shyama from a distance but has never expressed his feelings to her. The character of Uttiyo, who is dressed in white to underline the purity of his thoughts, probably represents Tagore. Tagore too had been unlucky in love throughout his life. After Shyama sees Bojroshen being chased and caught by the Guard on the pretext that Bojroshen is a thief, she falls in love with Bojroshen and resolves to help him. The Guard, who may also be in love with Shyama, tells her that there has been a theft from the Royal Treasury and they need to find a thief to save their honour – and who better than a foreigner? With Bojroshen facing execution, Uttiyo answers Shyama’s call for someone to save him. Uttiyo offers to sacrifice his life to save Bojroshen. This then leads to a tragic moral dilemma for both Shyama and Bojroshen. Although the Guard appears on stage as the villain of Shyama, he is simply fulfilling the orders of his masters, the King and Queen, whom we never see. Of course, the Guard does seem to relish his unpleasant task. Just over a year ago, a Facebook page called “We are all Khaled Said” highlighted the case of a young man who had apparently committed no crime but was pulled out of a cybercafé by Egyptian police and beaten to death, inspiring the revolution which started on 25 January 2011. During the protests which followed, centred on Tahrir Square in Cairo, snipers on the rooftops appeared to aim for the heads and hearts of protesters, leaving more than 800 dead. The question of who ordered them to do so has been a key aspect of the Mubarak trial. Since our return from Egypt, the country has sadly seen further tragedy. Although Tagore created Shyama in 1939, at a difficult time in both pre-Independence India and Europe, Shyama is timeless and universal. Our tour of Shyama in Egypt has illustrated that the dance concept he developed to express the meaning of his Bengali lyrics does cross linguistic and cultural boundaries as Tagore had intended, even today, because of its focus on the whole body language of the dancers. At the same time, Tagore’s humanist values expressed in the following song from Shyama are as appropriate for 1939 as they are for last year’s ‘Arab Spring’ and other current situations. The locking up of the good at the hands of the cruel – who will stop it? Who? The flow of tears from helpless, distressed eyes – who will wipe them away? Who? The cries of distressed people sadden Mother Earth. Under persecution from the strong, who will save the weak? Whose generosity will call those who have been insulted into his embrace? In Part 1, I explained the background to the Shyama in Egypt tour. Enrique Nicanor and I had decided to join the team at our own expense. We reached Cairo from Europe a day ahead of the team. Enrique had noticed that there was an article about the performances of Shyama at the Cairo and Alexandria Opera Houses in the Egyptair in-flight magazine, Horus. The article was the same size as one about the performances of Aida at the Cairo Opera House at the end of January! The performances were also included in the magazine’s events calendar for January. Unfortunately, the last leg of the team’s journey to Cairo – a flight from Jeddah – was cancelled. This meant that they had to catch the next flight from Jeddah and arrived in Cairo in the early hours of the day of their first performance. This was not only at the Cairo Opera House but would be attended by the Egyptian Culture Minister and other VIPs. The team was so tired when they arrived that we had to abandon the stage rehearsal we had intended. As became our routine on all the performance days, Mithuda (Debanshu Majumder), Enrique and I went to the theatre first to supervise the technical setup, including lighting, sound and projection of the subtitles. Essam A helped us to communicate with the theatre technicians. Although we tested the projection of the subtitles at the Cairo Opera House with the first part of the sequence, as time moved on, it became clear that I wouldn’t be able to finish adding all the Arabic subtitles, together with all the necessary video processing, in time for the start of the performance that evening. So, rather than showing the subtitles for part of the show and then leaving the audience without them for the rest, we decided to present the show that evening without the subtitles. We knew that we had a receptive audience at the Cairo Opera House when there was a round of applause each time I introduced a new character and they appeared on stage one-by-one. As the show went on, there was applause after each scene. Naturally, this spurred the team on. In our film version, we had deliberately kept the timing on the soundtrack very tight to avoid giving any opportunity for the attention of the audience to wander. The team had to be very focused to match this timing on stage, including costume changes. It would have been obvious to anyone watching the show the team had been rehearsing for weeks before the tour. 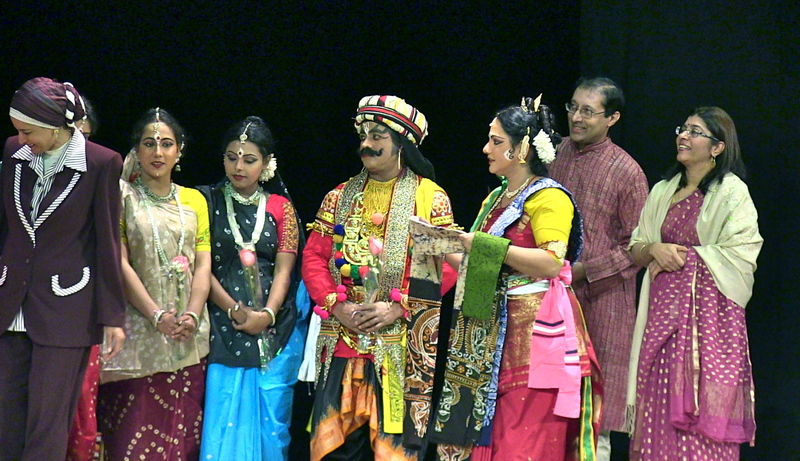 Soon, the show was over and the Egyptian Culture Minister, the Indian Ambassador and Mrs Durai, Director of the Maulana Azad Centre for Indian Culture, came on stage to presented flowers to all the performers. We all returned from the Opera House exhausted but happy that it had been so well-received. The next morning, we travelled to Ismailia. Unfortunately, once we arrived, we realised that there was a fault with some of the technical equipment at the hall, which limited our ability to adjust the lighting and set up the backdrop. We also thought it would be too difficult to add the problem of projecting the subtitles to these technical challenges. 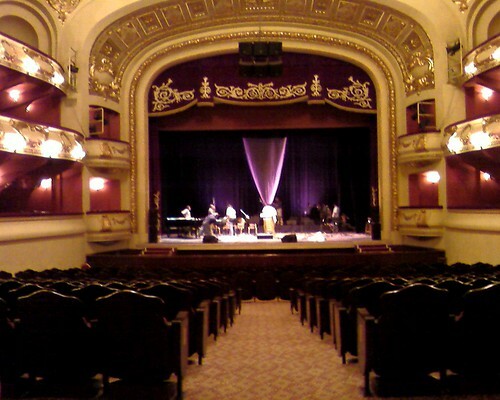 So it was the performance at the beautiful Alexandria Opera House which became the world’s first subtitled, live performance of Shyama. The technicians from the Cairo Opera House very kindly came to Alexandria with their digital projector especially to make this possible. I cannot describe the thrill of seeing the subtitles appear as the show began – the audience could experience the combination of my novel, digital technique with the dancing! Finally, after all the preparations, they had the option of referring to the Arabic and English subtitles during the performance. 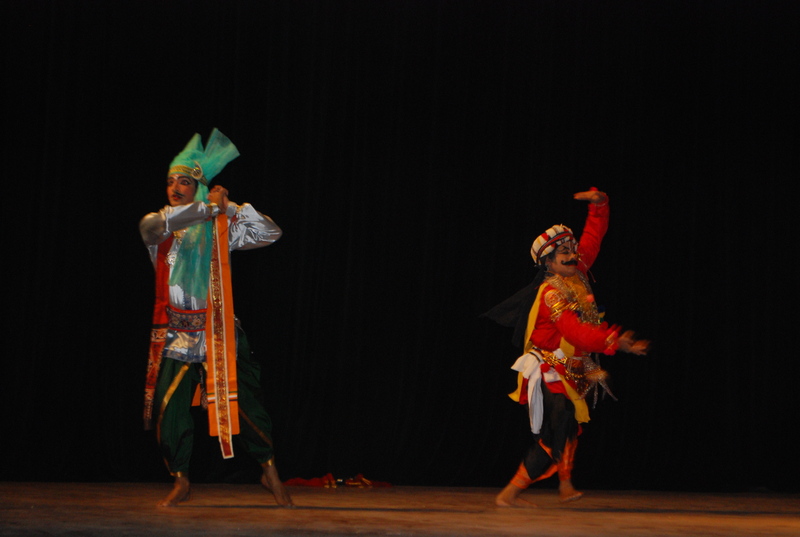 I should take a moment to pay tribute to all the technicians at each of the theatres in which we presented Shyama. Without their help, it would not have been possible to present such a technically demanding show. 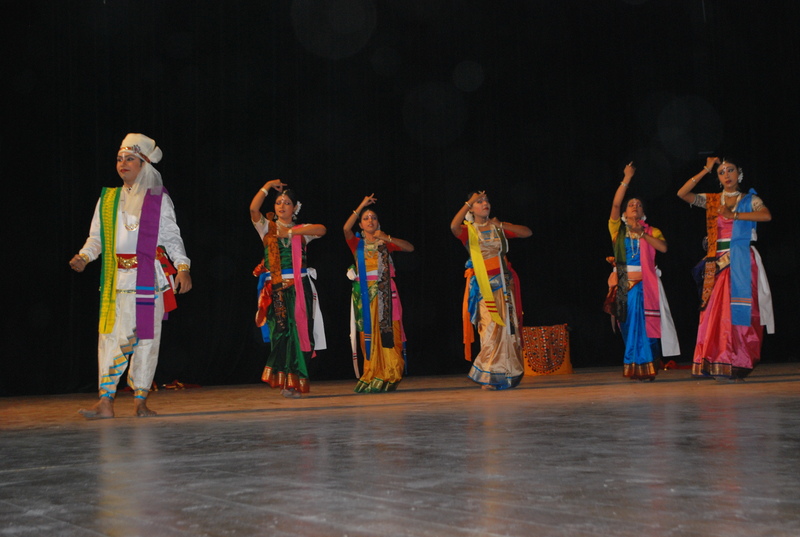 Ambassador R Swaminathan and Mrs Durai very kindly attended almost all the performances. After each performance, there were often people from the audience coming up to the dancers, asking to be photographed with them. Especially at the the Giza performance, though, several people, particularly Egyptian women and children, came onto the stage seeking autographs, photographs, and so on. It was clear that Shyama had struck a chord with them. The day after the final performance at Beni Suef, where Mahmoud helped us to communicate with the technicians, it was time for the team to return to India. As Kaberi was having her last lunch at the Safir Hotel, where the team had been staying, their guest relations Director, Ohoud Al Shuaibi, came up to her. She explained that she and her husband loved Indian films and had become very fond of the team during their stay at the hotel. They were always smiling, polite, and never apart, as well as being very popular with the hotel staff. She and her husband had hesitated before taking up the invitation of staff at the Indian Embassy and Cultural Centre to attend the Giza performance: they hadn’t been sure if she would enjoy a performance in a language she wouldn’t understand. However, she had been very impressed by the show and particularly by Kaberi’s performance as Shyama. She told Kaberi that her dancing had been so expressive and her body language so clear that they had understood everything. Kaberi was very moved by her comments – it is the highest praise a dancer can receive is to hear from someone in the audience that they were so touched by the performance. The video below is an excerpt from the interview Enrique filmed with her shortly afterwards, after Kaberi and the rest of the team had set off for the airport. I think it illustrates how deeply moving and memorable our Egyptian audiences found Shyama and the team’s performances. I know already that I will need more than one post to do justice to the experience of presenting Rabindranath Tagore’s last dance-drama, Shyama, on tour in Egypt. The tour by Kaberi and a team from Santiniketan was organised by the Maulana Azad Centre for Indian Culture in Cairo, together with the Indian Embassy there, to celebrate Tagore’s 150th birth anniversary. 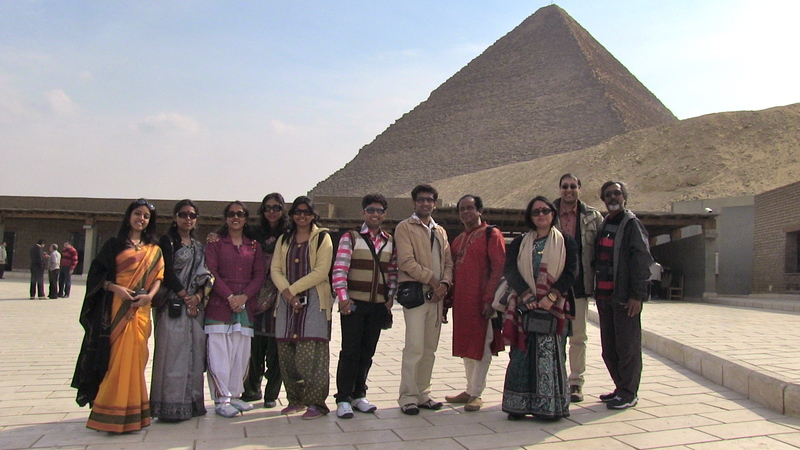 It was sponsored by the Indian Council for Cultural Relations as part of a cultural exchange programme between Egypt and India, in association with the Egyptian Ministry of Culture. Kaberi and the dancers in the team were performing to an adapted version of the soundtrack from our film version of Shyama , with Arabic and English subtitles projected above the stage. The English subtitles came from our film version of Shyama, as translated by Jayanta Chatterjee (my father), Kaberi and myself. The Arabic subtitles were kindly provided by translators at the Indian Embassy and reviewed with the help of Essam A of the Maulana Azad Centre. The lighting design and control was provided by Debanshu Majumder, who had also done the lighting for our film version. The inaugural performance at the Cairo Opera House was attended by the Egyptian Culture Minister and other VIP guests. Before each performance of Shyama, there was a short performance by Padmashree Sumitra Guha and her team illustrating the way Tagore based the tunes of some of his songs on Indian classical ragas. With thanks to Sangeet Bhavana, Visva-Bharati University, Santiniketan for the use of the Sangeet Bhavana stage for rehearsals, as well as for the participation of Asst Professor Basanta Mukherjee and Sangeet Bhavana students. The performances were very well-received. In Part 2, I’ll describe how the tour went.